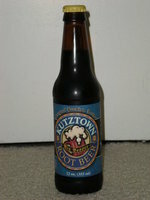 "When you're bad for something mighty good, reach for a foamy mug of Kutztown Root Beer. Tastes chust like old-fashioned, 'cause you know we make it that way. Drink 'til you ouch, there's more back!" I swear this is what the back of the bottle says. I bought this thinking that my Pennsylvania brethren would get their act together and produce a quality product. Nope. The first ingredient on the bottle is "triple-filtered carbonated water," which makes sense because that's what you taste the most, water. It's a very dull root beer flavour going on here. In fact the best way to describe it is A&W from a fountain with too much water, not enough syrup. Sad. Another negative is that the sweetness (supposedly provided by "pure cane sugar") is a little off tasting. Not as off as that Root Beer Float thing reviewed earlier, but still strange. One positive I can say about this is that "triple-filtered" must me "not really that carbonated water," which is nice. A lot of root beers are just way too carbonated. All in all though, it's not horrible. If this was cheap or on sale I could see myself buying it...but it'd have to be a heck of a sale. I've been to Kutztown before, I'm not sure why, but I'm sure I'll never be again. If someday I do end up there, I'll be sure to hang my head in shame.